Attractive and comeptitive media for Promotional Gifts all the year round. The Kite season rotates all over India all the year round. Mass Advertising alternative in Tissue Papers, and Polyester Film. 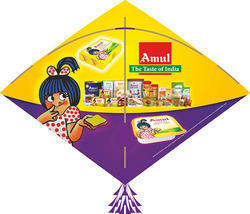 We are in to manufacturing and providing kites which are used as an promotional Kites or advertising kites . Your company name and logo printed on flying kite made from tissue paper, polyester film, bopp, hm. Polyester film which is a tough material which can fly again and again available in 19" x 19', 17" x 17" , 15" x 15".